Monmouthshire Encompassing the dramatic Black Mountains in the north, to the market towns of Abergavenny and Monmouth, through to the rural valleys around Newport and Chepstow on the banks of the River Severn, the Wye Valley & Vale of Usk are true areas of outstanding natural beauty. With awesome castles, bustling market towns, fresh-farm produce, an artisan tradition, generous hospitality, and sunshine and showers. Monmouthshire and the Wye Valley is a captivating experience that treats the senses at any time of year. 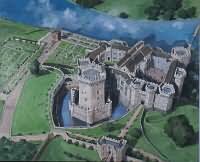 Choose to visit from a wide selection of castles in the region: from the mighty Chepstow Castle at the very entrance to Wales, to the isolated White Castle near Abergavenny. Watch them all burst into life, with staged banquets and civil war battles at Caldicot Castle, falconry at Raglan Castle, and medieval pageants at Abergavenny Castle. Enjoy the breathtaking scenery, fascinating heritage and wonderful hospitality of this border area, where Welsh and English influences blend. Croeso i Gymru! Welcome to Wales! Monmouth is an elegant town with a splendid location at the confluence of three rivers - the Trothy, Monnow and, more famously, the river Wye. 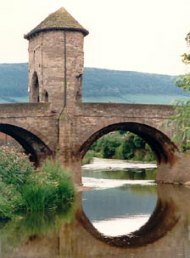 Its world famous 13th Century gateway, on the Monnow Bridge, is unique in Britain and befits the town's proud past. Monmouth boasts some fine Tudor buildings but is also a gem of Georgian architecture. The old coaching inns and Georgian Shire Hall in Agincourt Square make it one of the most attractive of its kind in Wales. This is the town's heart where the high street, narrow lanes of individual shops and attractive courtyard eating areas come together. Usk taking its name from the river which runs through the town, Usk has an enviable reputation for its summer floral display and for its salmon fishing! But behind the hanging baskets and window boxes you will find antique and craft shops and numerous pubs, hotels, cafes and restaurants. We hope this guide will help you discover the best of Usk. Stay awhile and enjoy the relaxing atmosphere of this pretty little town! If you need further assistance visit the Tourist Information Outlet located at Usk Rural Life Museum in New Market street which holds a selection of tourist literature as well as details of local accommodation.The largest fort in Roman Britain was built here between 55 AD and 66 AD. Called 'Burrium', it had a garrison of 10,000, five times the population of modern Usk. Ruins of the fort have been found in recent years beneath the town's streets.Usk Castle, built by the Normans in the 11th century, later became a Royal Castle, and was given to Catherine Parr (Henry VIII's sixth wife), by the King.In the 19th century Japan Ware made in Usk was highly prized and graced the tables of the French Court and the Duke of Wellington amongst others. Abergavenny the natural gateway to the Brecon Beacons National Park. Set on the north bank of the River Usk the town has always been an important market place serving the surrounding countryside, a tradition which continues today with busy retail, craft and antique markets held in the impressive market hall. It is dominated by three nearby mountains - the Blorenge, SugarLoaf Mountain and Skirrid Fawr. Abergavenny is a popular walking and outdoor activity destination, and for history enthusiasts the recently designated Blaenavon Industrial Landscape World Heritage Site, which includes the tranquil Monmouth and Brecon Canal, is right on the doorstep. There is also a rich religious local heritage. St Mary's Priory Church has an impressive collection of medieval monuments including the famous Jesse carving, and nearby Partrishow Church has a beautiful carved oak chancel screen and gallery. The Holy Mountain (Skirrid Fawr) is associated with much religious legend whilst the grandeur of Llanthony Abbey, set amidst the mountains, has inspired visitors for centuries. Caerleon - the ' fortress of the Legion' - was one of the most important military sites in Britain under the Roman Empire. It was the home of the 2nd Augustan Legion housing 6,000 soldiers and horsemen, with an amphitheatre, baths, shops and temples.Today Caerleon is an attractive historic town with a selection of pubs, restaurants and tea rooms. Aspects of Roman history are brought to life at the imaginatively displayed Fortress Baths (once a giant 'leisure centre' with heated changing rooms), a swimming pool, a huge gymnasium and bath halls. The Roman Legionary Museum graphically portrays the daily life of the garrison with life-size models and an exciting 'hands on' area for children. The amphitheatre and barracks - currently the only Roman barracks block visible in Europe - are open free to the public all year round. Caerleon is also the setting for unique art and craft centre, Ffwrwm, and artwork can be admired around the town on the Caerleon sculpture trail, featuring sculptures from a range of artists from several countries. Visit the Caerleon Arts Website for further information on the sculpture trail, and the up-and-coming Caerleon arts festival. Tintern there is much more to Tintern than its magnificent Tintern Abbey. Allow a morning or afternoon to walk around this pretty village and you will be rewarded with many pleasant memories of a delightfully scenic spot in the heart of the Wye Valley. Tintern is home to several different walking trails, in addition to notable areas of interest. A wooden bridge a little to the north of the Abbey crosses the River Wye, and is open to the public on a yearly basis. The bridge leads to a choice of several clearly marked walking paths, most notably a path to 'Devil's Pulpit' and a path to Offa's Dyke. 'Devil's Pulpit' is a small rocky outcrop that overlooks the abbey. According to local legend, the Devil used to preach from the outcrop and attempt to seduce the Abbey's Monks away from Christianity. The ruins of 'St. Mary's Church' can also be seen on a hill to the east of the abbey. The church itself was ruined by fire in 1977, though much of it is still clearly visible today. A disused water-driven mill lies a little to the south of the abbey. Visitor information and shops can be found close by. The village also boasts an award-winning vineyard. Raglan with its famous Castle is a historic village situated in the county It has a population of 2000 with 500 houses and a junior and infants school. 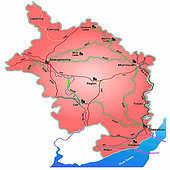 Raglan has many neighbouring villages such as Llandenny, Kingcoed and Tregare. 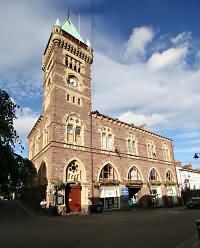 Drive through the high street and pass the Beaufort Hotel and St Cadoc's Church, plus a number of small friendly shops. 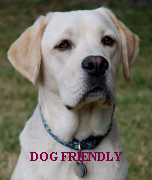 Raglan is also very community minded with many different clubs and organisations you can join including a golf club. Newport proud of its success as a 'Wales in Bloom' winner, with gorgeous floral displays in its parks and city centre every summer. It is a city of contrasts - medieval cathedral and castle rub shoulders with exuberant Victorian architecture, Roman walls and amphitheatre contrast with high-tech developments. Newport has one of the finest leisure and entertainment centres in Britain, as well as an excellent art gallery with important collections of British paintings, ceramics and sculpture. The museum houses Roman archaeology, relics from the famous Chartist uprising in South Wales (which ended at Newport), and a fascinating 'Wildlife in the Home' display. The city's most famous land mark, the Transporter Bridge, has been restored to working order and continues to carry visitors by gondola across the river Usk. Tredegar House is South Wales' finest country house and was home to the powerful Morgan dynasty for over 500 years. Fascinating tours take visitors 'below' as well as 'above stairs' to the servants' quarters and gilded staterooms. The 17th century mansion is set in 90 acres of magnificent parkland with restored walled gardens, a restaurant and craft workshops. The city centre offers a traditional market hall as well as today's top retailers.